You want to use popups but at the same time, you want to preserve your user experience? You want to make sure your popup doesn't prevent your users accessing your content on mobile devices? You want to give users a second chance to see your popup after they've closed it? Then, you're on the right page! The tab is a kind of smaller popup that displays after or before your popup. 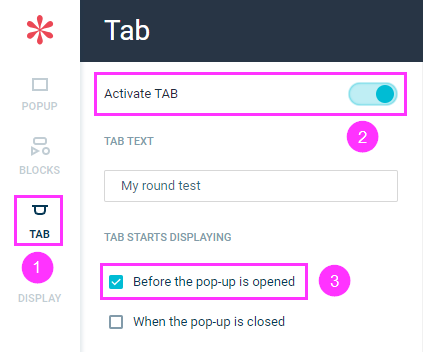 Displaying the Tab before your popup helps you make your campaign less intrusive: your visitors will only see the full popup if they click on the Tab. It also makes your popup campaigns more adapted to mobile devices and fully compliant with Google's guidelines for mobile popups as it doesn't hide your content. To activate it, open the Tab section in the editor. 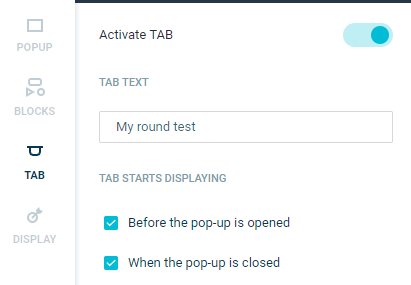 Activate the tab and check "Before the pop-up is displayed"
Activating the Tab after your pop was displayed gives your users a second chance to see your popup. After they close your popup, they can see your popup again by clicking on the Tab. You can activate the Tab before and after the popup display at the same time. We don't count Tab displays as "Displays" in the Dashboard.